General Electric Wires Buick In 1911. Here your looking at an addition to the Weston-Mott family of plants. 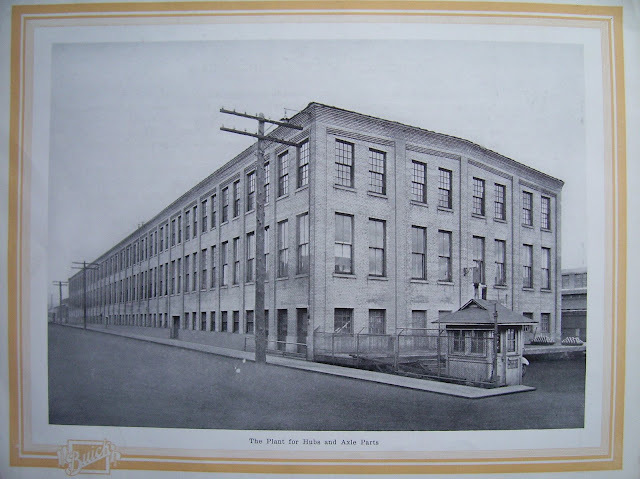 This is #4 built in 1909, then totally owned by Buick Motor Company in 1917 becoming Buick factory #34. 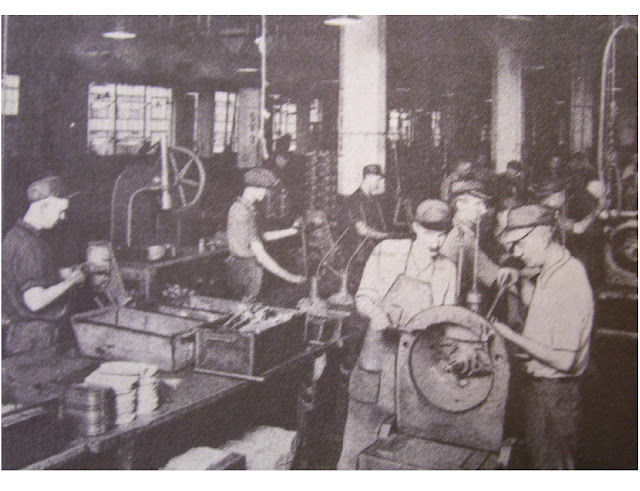 This factory produced hub and axle parts, bushings and drain valves. 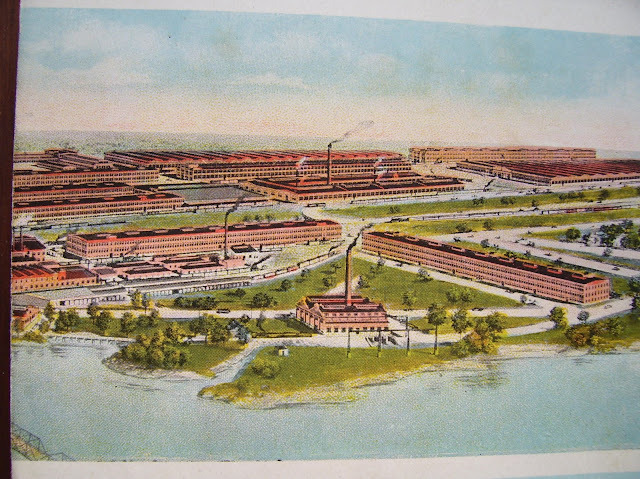 This factory is directly north of the Imperial Wheel Company plant which by this time was owned by Buick. This view is facing north east. This photo was manipulated by the Buick photographic department before publication as evidenced by all the rail tracks being removed in the left foreground. I have found no rhyme or reason as to which photos they would do this to because some showed tracks and some did not. They would change things that make no sense other than maybe job security. You always had to seem busy whether you were or not and so went the dance at Buick. 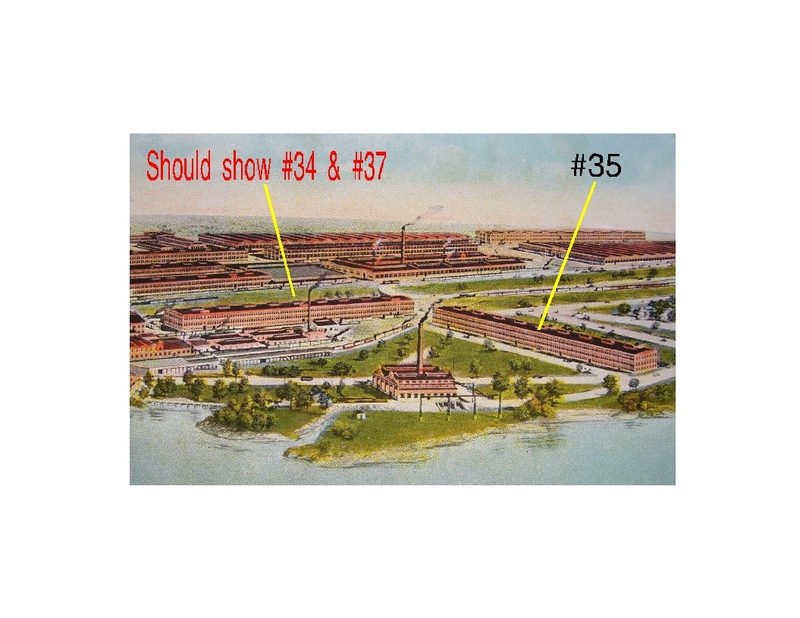 This factory was demolished in 1936 making way for building #84 used for past parts and then engineering. 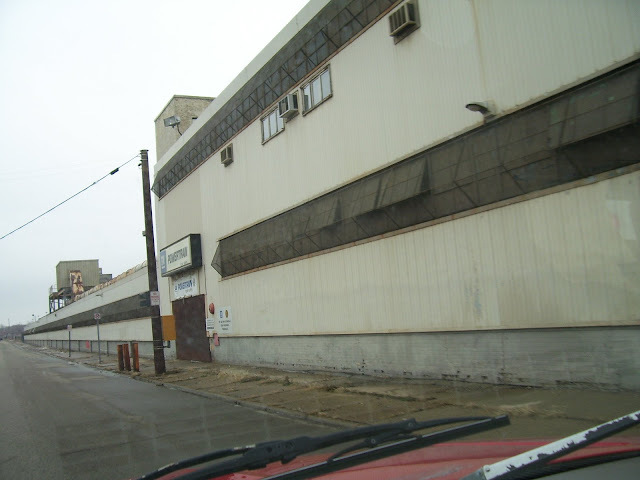 This view is facing north east at the engine plant from Stewart st.
Driving up Industrial st past #31's gate. 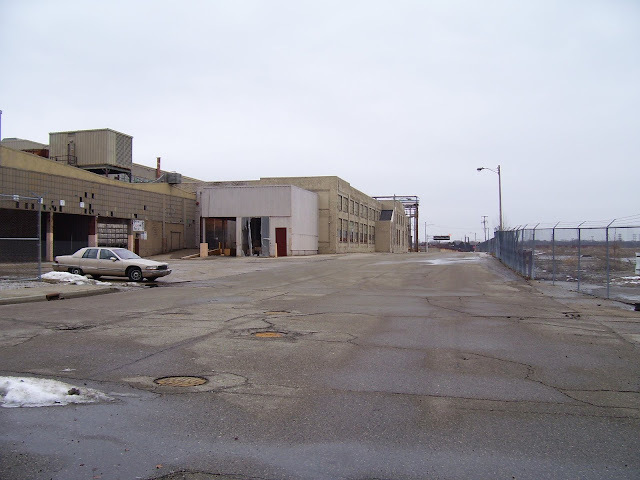 Looking north up Industrial Avenue at factory #31 from the Leith st gate. This view facing south east would have had factory #04 in the distance. 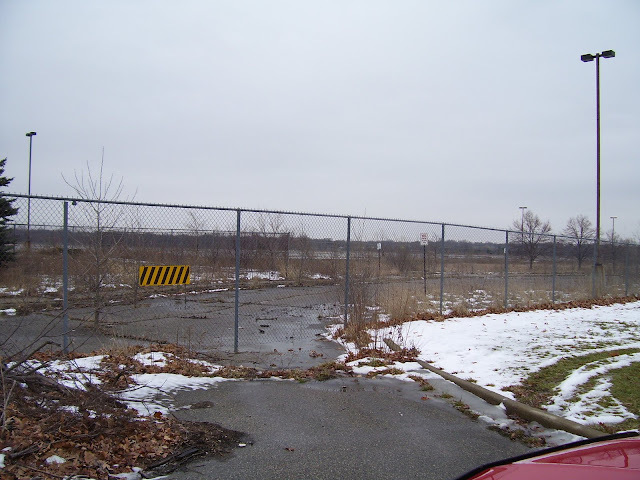 This view is facing east at what was, factory #12's location. 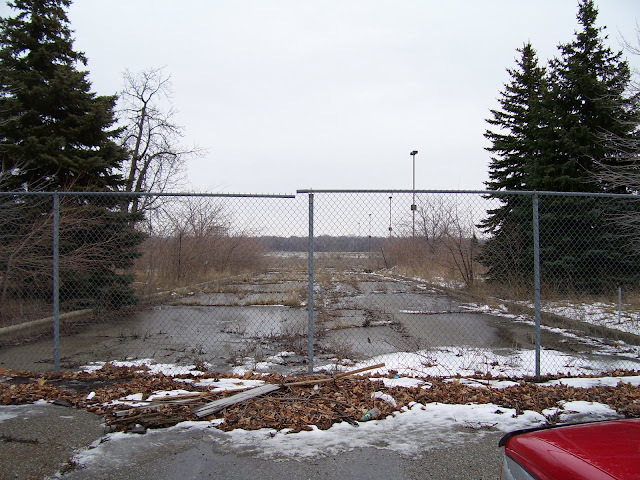 This view is looking south east across the parking lot towards the Industrial and Hamilton intersection. The 2001 entrance above and 2008 Warren street entrance below. This is the first entrance to the Warren street parking lot as you go (north) on North street. Looking northeast at the last part of factory #12. 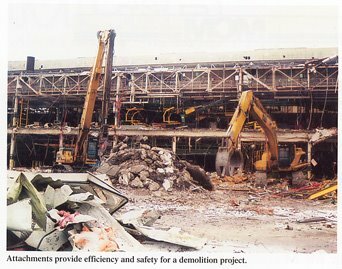 Same view during demolition in 2002. This view is looking south east from Leith street across the site of factory #12. 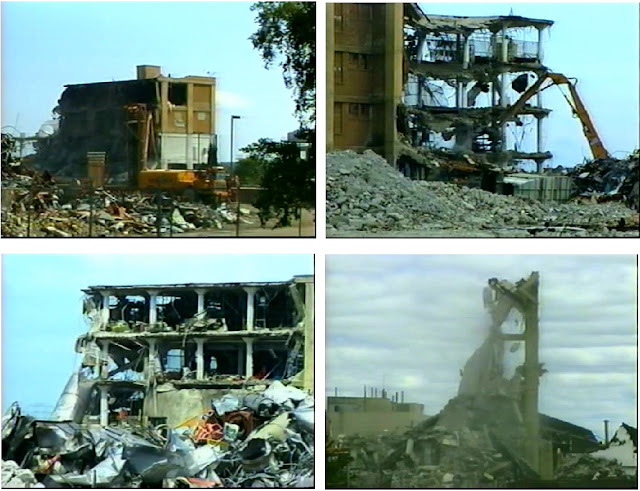 Top two photos are from Leonard Thygesen's film on the demolition. The bottom one I took. The south end of factory #31 January 29th, 2008. Old factory #11 closeup January 29th, 2008. The same view in 2002. 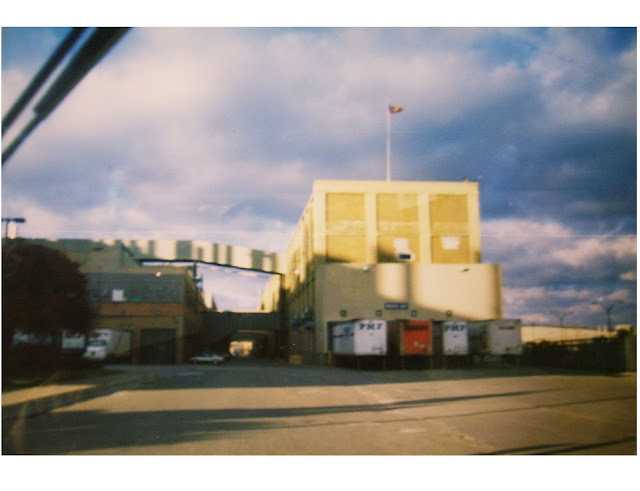 This view is facing east from the Leith st gate with factory #31 and then old #11. Oak Park with factory #31/#11 in the distance, this view facing north east. Oak Park entrance facing east 01-29-2008. 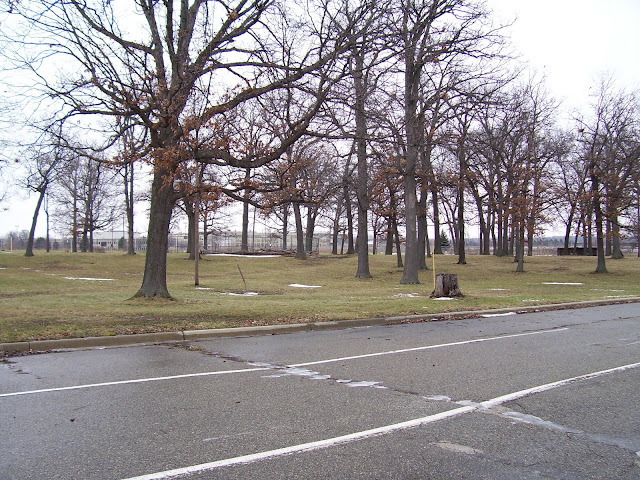 The last Headquarters In Flint, Michigan. 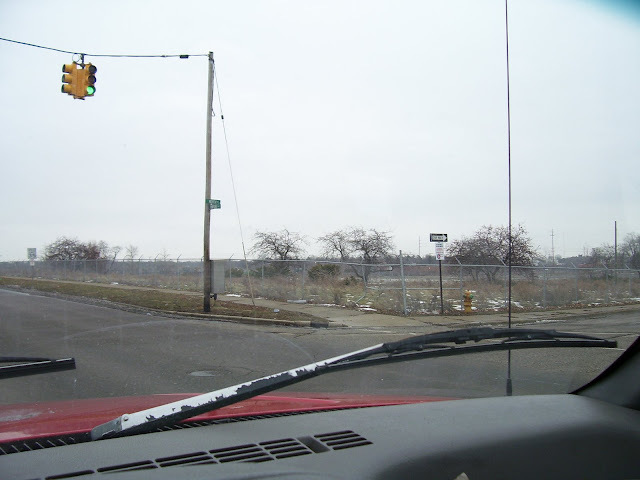 This view is facing south east across the intersection of Hamilton ave and North st, showing where the last main office (World Headquarters) was located. I took this photo January 30th, 2008. 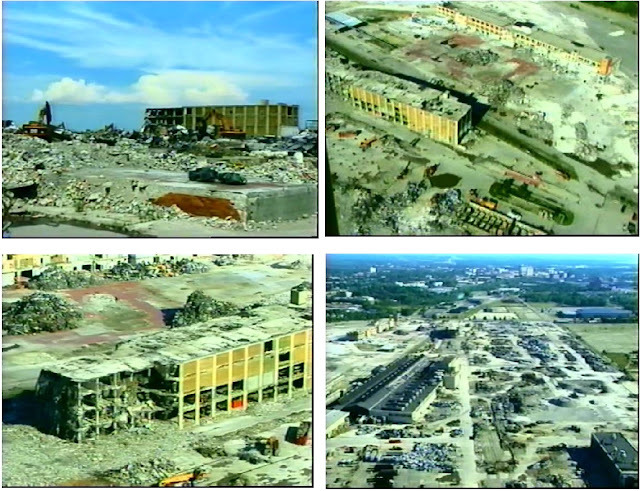 This and all the following clips are from the Leonard Thygesen documentary that shows the demolition inside and out of this building. Go here to order from Leonard. 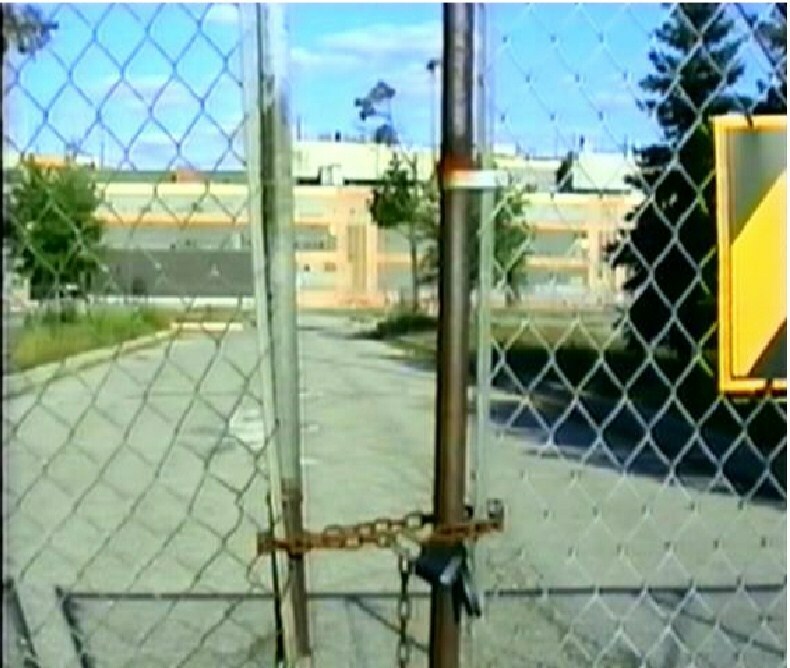 Factory 40's end during the summer of 2002. At bottom right the last piece was the odd shaped south east corner with the train shed in the background. Still shots from Leonard Thygesens documentary. This shows the dignitaries touring the new engine dress in 1984. I have a great story about this day but it is for my memoirs only. Here's a photo from happier times in the old transmission plant. This was the new pilot line in 1984 for the power-train dress on the first floor facing north west. These little robots would run over mice and flatten them, then the workers would draw chalk lines at that spot labeled "MOUSE CROSSING". Top left photo looking at #40 in the distance is from the corner of Hamilton and Industrial. Top right shows the tank farm at the bottom with new #40 gone and old #40 in the process, factory #28 still standing. Lower left is another view at old #40 facing south east. 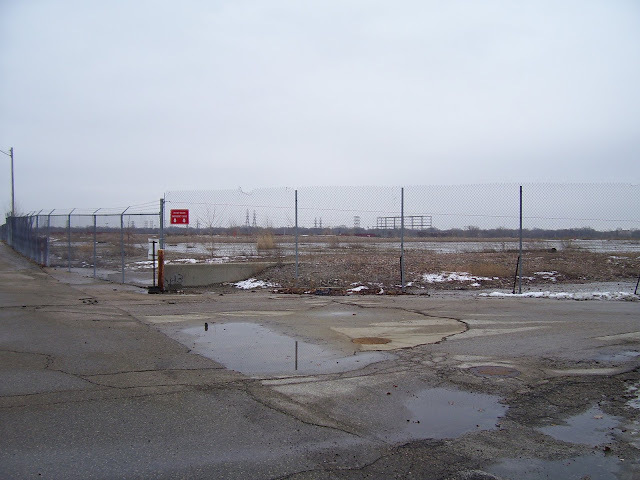 Lower right is an overview of Buick site south of leith st. with downtown Flint in the distance, factory #29 in this photo is at lower right, #02 train shed at the left.Photos from Leonard Thygesen demolition documentary. At top left was our break area on the third floor of factory #40. Top right I'm going over the bridge, shown below, from the 2nd floor of new #40 to the 3rd floor of old #40. 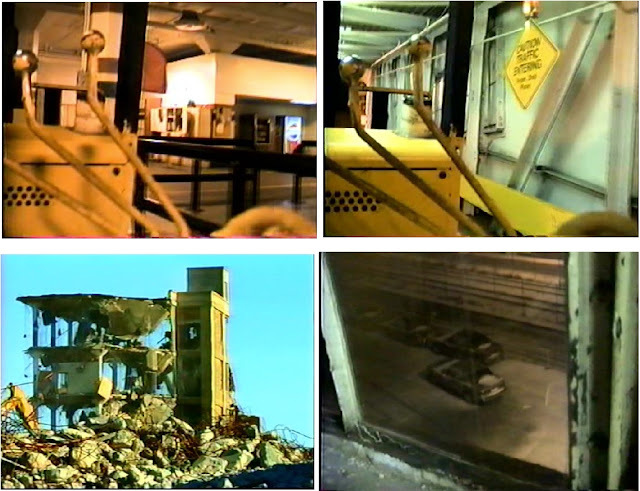 Bottom left photo is towards the end in august 2002, you are looking at the south east corner. Lower right was the view from our break room through one of the few surviving window frames from the old days, looking at the rail line and a few new Buick's in the snow. Looking north up Division Street between the two factory '40s. The red arrow is the location of my fork truck shown at right top above. I took this photo through the windshield of my truck while driving north up Division street in 1997. The tall building with the flag is old #40. 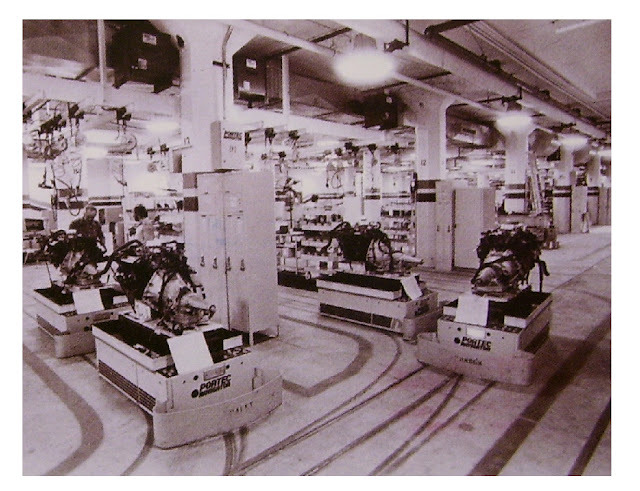 Here's a view of parts machining in the transmission plant from a 1953 Buick publication. 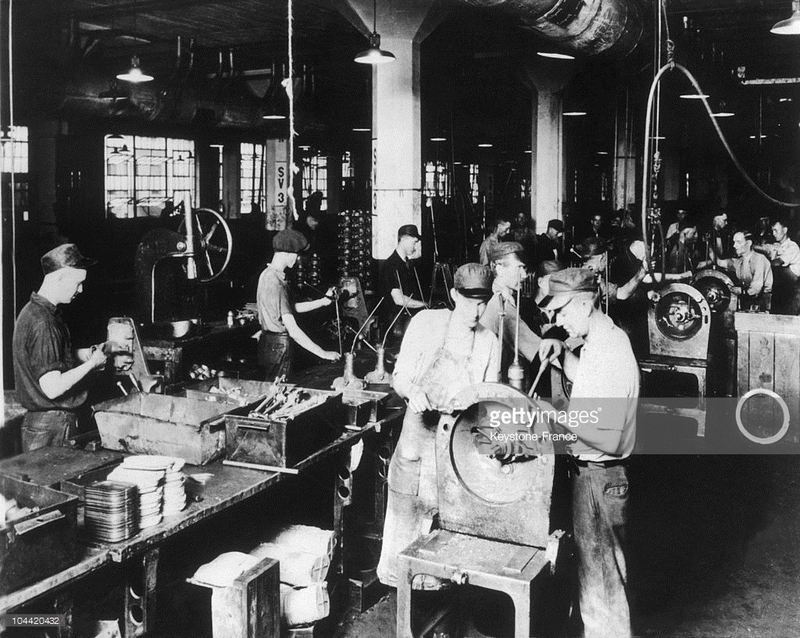 Here you see transmissions being assembled on an early assembly line, this is probably a manual line where the worker would just push a dolly ahead to the next worker. 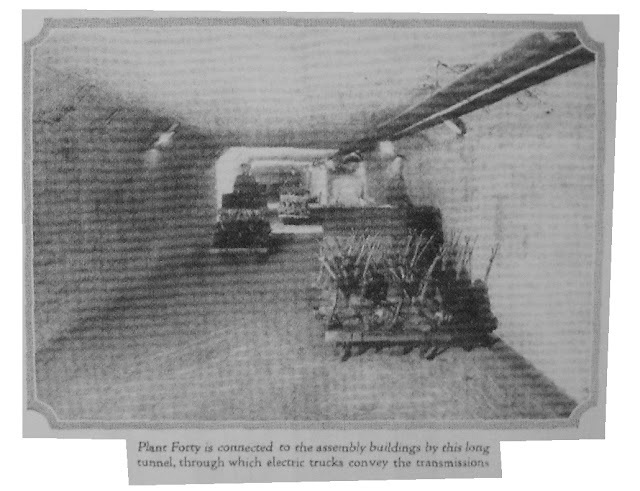 This view of the tunnel under Division street would be facing west. The transmissions are on flatbed trailers probably hauled by electric mule. This tunnel would lead to the basement of factory #06. You can see a pillar in the distance in factory #06. 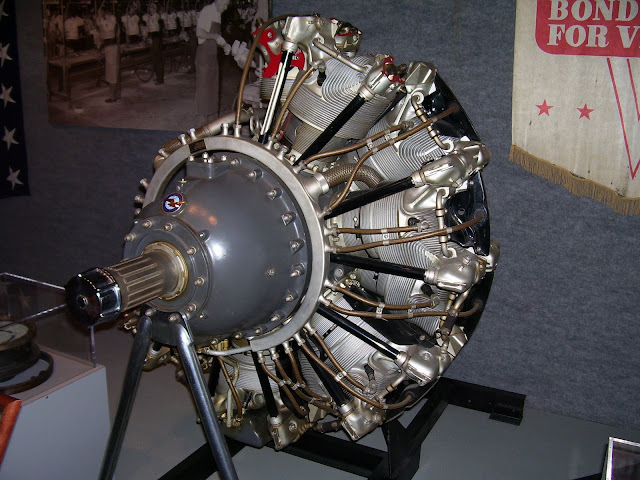 This and the two photos below show a Liberator engine display at the Sloan museum in Flint. 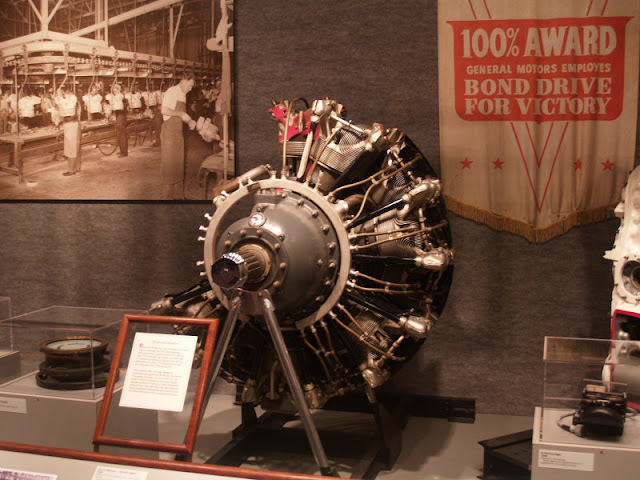 Many parts for this and other war material were machined in this plant. 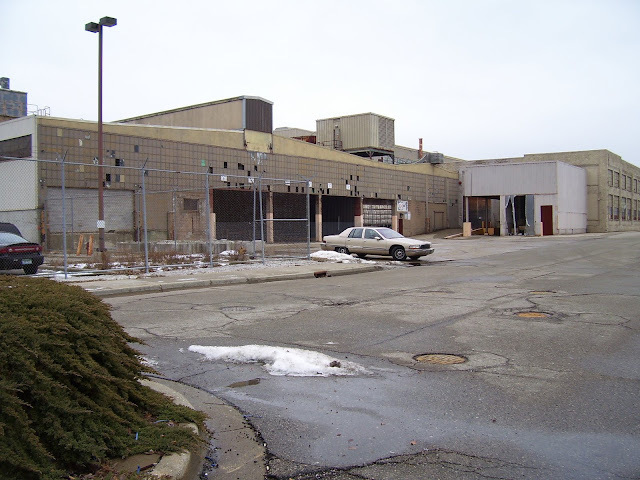 This view of factory #40 facing north east across Division Street must be just after being built because the support for one of the water towers to the north is just getting finished. 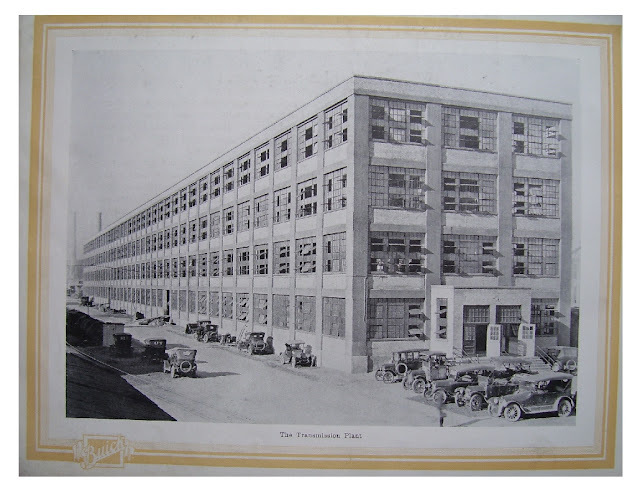 This factory always fascinated me because it had all the elements of Buick from the 1920's. 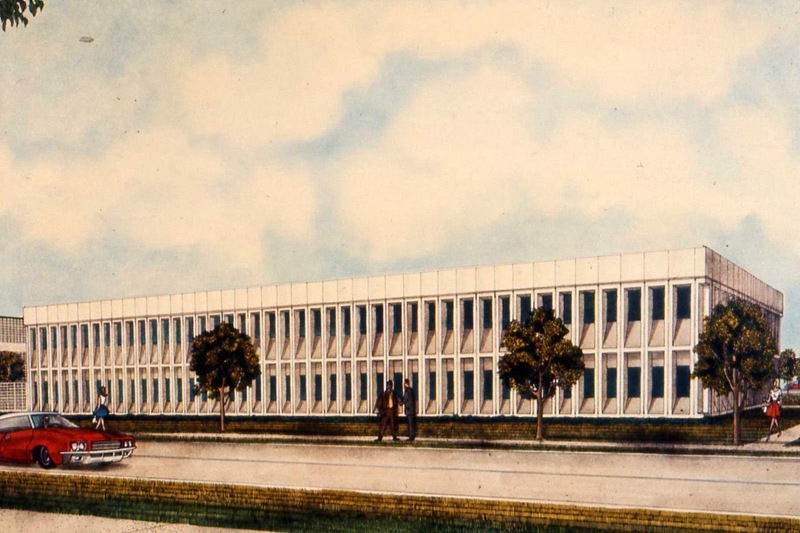 First of all it was built of reinforced concrete like all factories across the country at that time. You now see these as warehouses and even converted into condos. 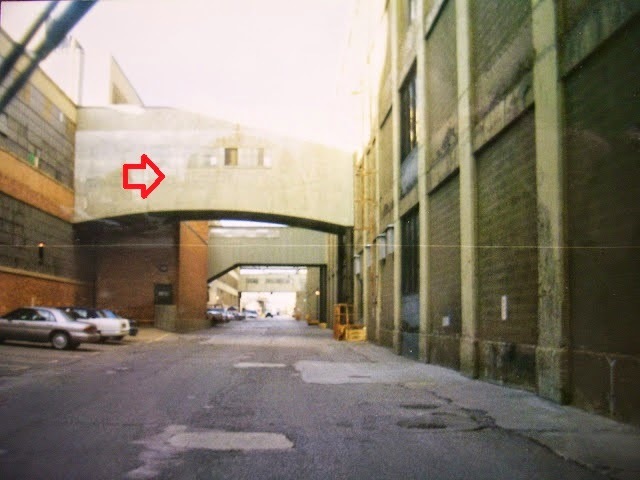 The entrance you see at the lower right was removed as I recall in 1982 when they were reopening this plant after being condemned for many years and a new truck dock was built. About 95 percent of the original windows and frames were removed then bricked over. The north truck dock was still a huge wooden affair before it burnt in the early '90s. The old open air rail dock on the east side platform had a large air suspended building installed with two air locks for entering and exiting. "One side note to the air building": during it's construction some people I know placed a scooter, (belonging to a well known supervisor) in an open pit ready to be filled with concrete. 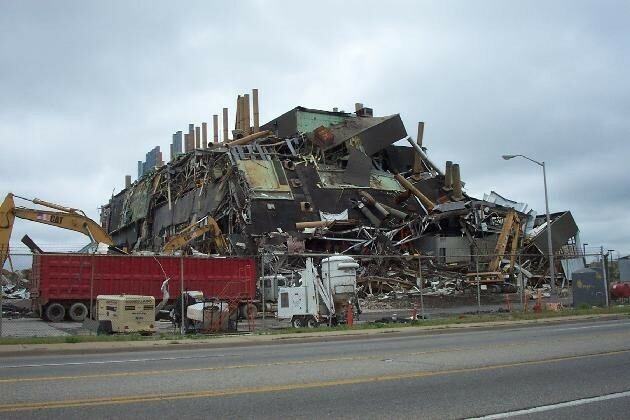 I'll bet the demolition crew got a kick out of it when they found it. The elevators were kind of small compared to what we had in the newer buildings and had wooden slat doors that you pulled down, plus the old style handle for controlling which floor you went to, "nothing automatic there". At the north end was a long ramp made out of springy steel that was quite a ride up or down to the second floor. 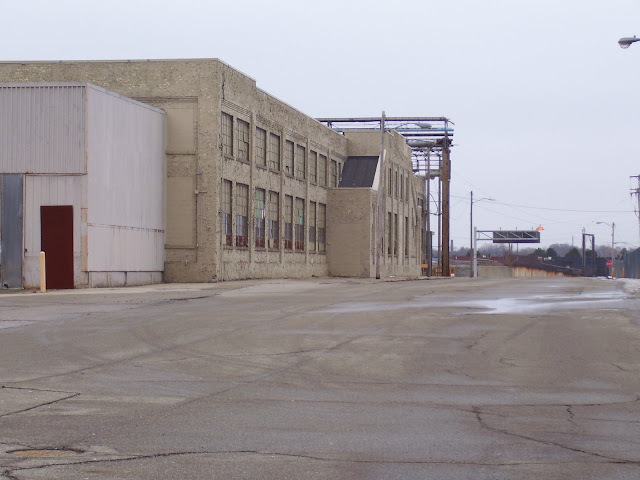 The old heat treat annex #41 at the north east corner was cleaned up and always used for presentations of one sort or another like the 1,000,000th Buick City Le Sabre. "As I stated in previous posts", the basements were almost always flooded and I know first hand that there were at least 3 and rumored to have been 4 levels. 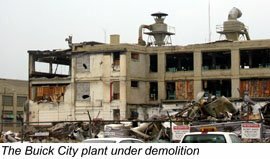 The tunnel that ran under Division street was there in 1985 but the old elevator shafts that raised transmissions up into factory #06 were filled with rubble. 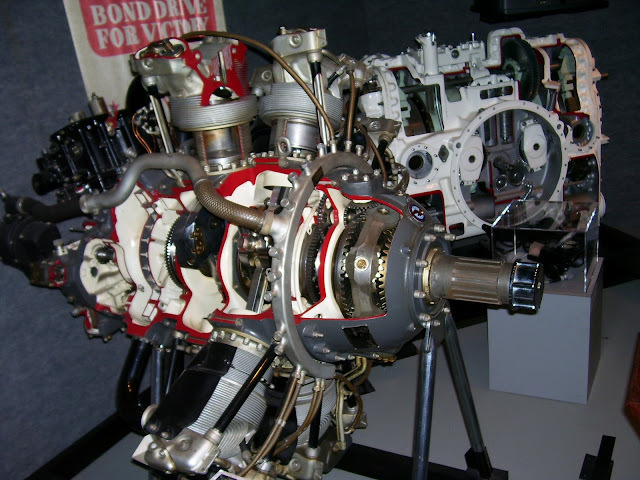 The rumor about the old Liberator engine tooling and parts still being on benches down there I personally did not see but my time was limited and it was pretty nasty down there. All the stairwells had handrails made out of large diameter pipe just like all the railings around the factories in the '20s. One weekend a fork truck driver was knocked in the head when he was alone and found later (still unconscious) and he was never right in the head again. You had to be careful at Buick and the surrounding area because the criminal element knows where the money is. 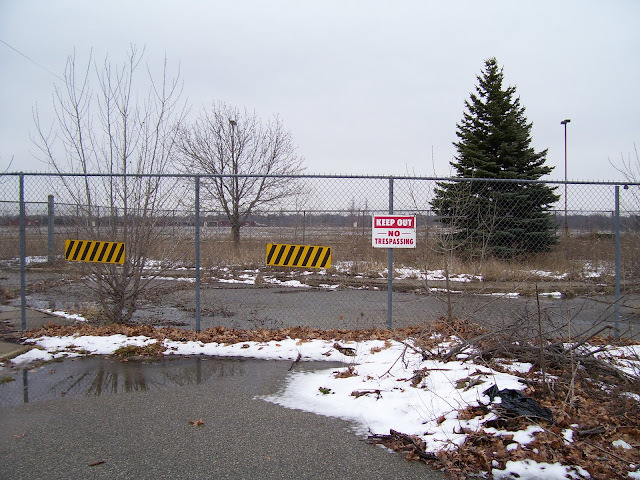 If you ever noticed the fences around the complex they were meant to keep people in, not out. I had a few altercations with knives involved but that's for my memoirs. During 1982 the first A.G.V. 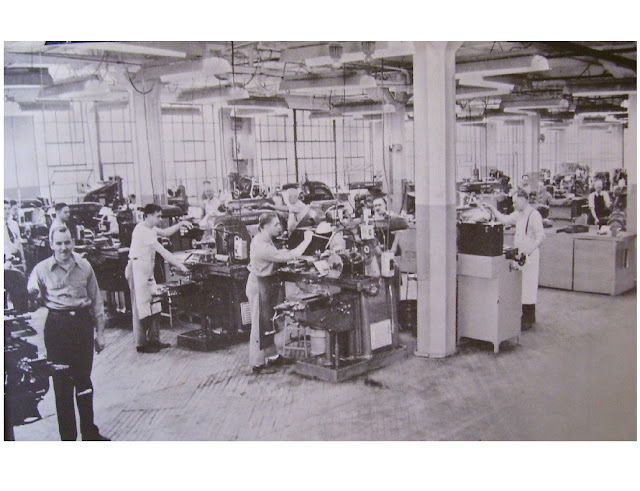 (automated guided vehicle) line was a pilot program in this building on the first floor used for the engine and transmission dress, complete with a tour by the G.M. president himself plus entourage; another story for my memoirs. 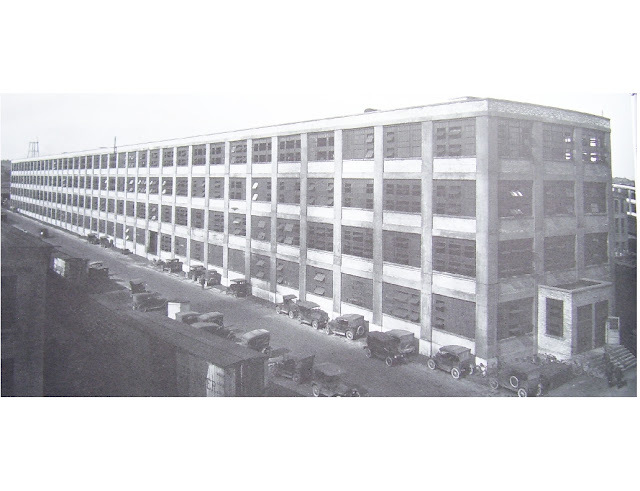 The northern section of the first floor was were the exhaust system was assembled and sent over the bridge to final assembly during Buick City's time. 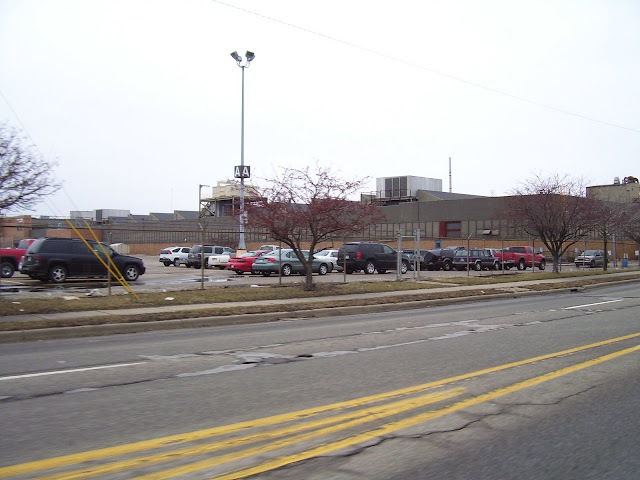 This factory also became the new Riviera assembly plant in 1962. 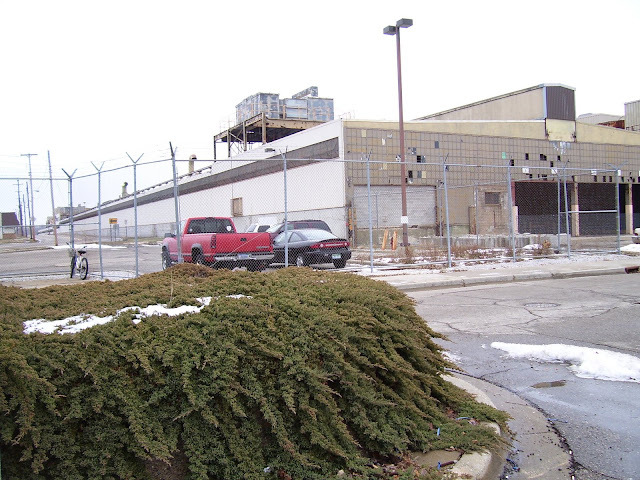 This view of the original #40 plant was taken from factory #01 across Division street facing north east. 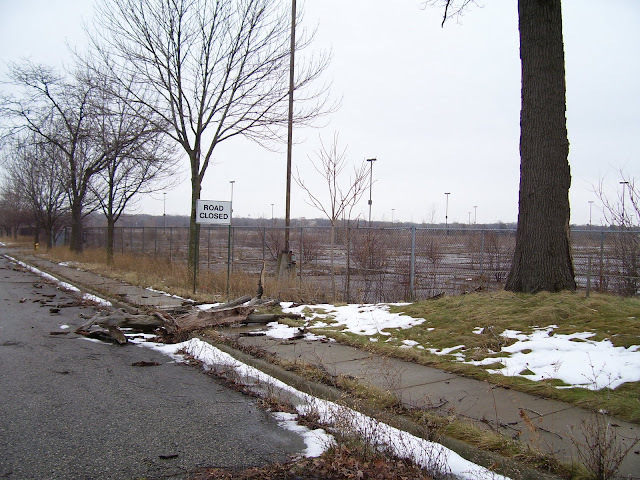 This was Buick's first big transmission plant built between 1919-1920 and would be completely demolished on august 6th, 2002. 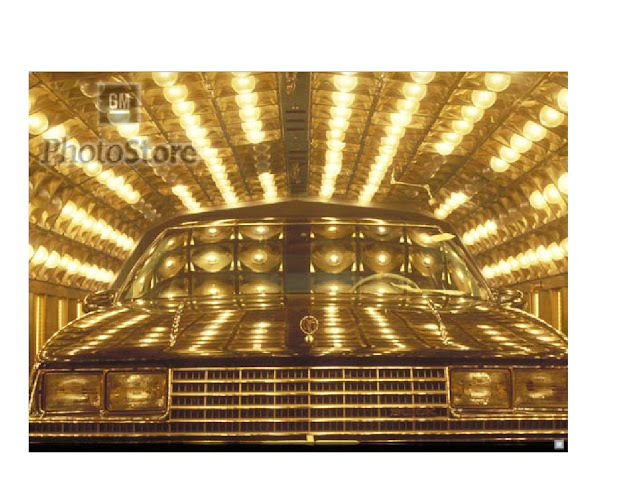 You see here a 1986 Buick Le Sabre going through the drying oven located on the repair floor adjacent to factory #40/bldg #16. This view is facing south. 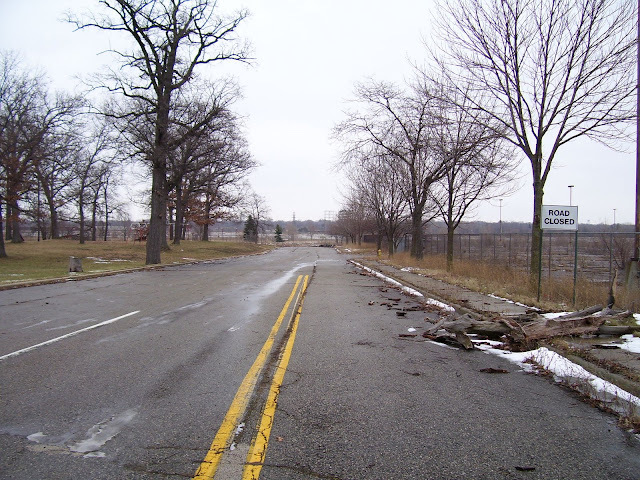 Here you are looking north across Hamilton showing #44 almost down for the count in 2002. 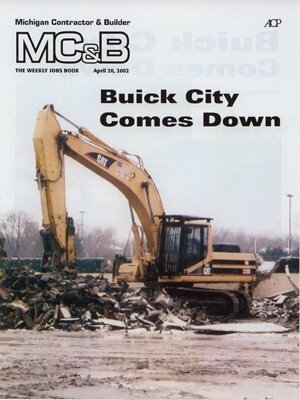 The movies taken of the Buick demolition are quite a sight. Final Line through The years. M18 Hellcats ready for shipping.